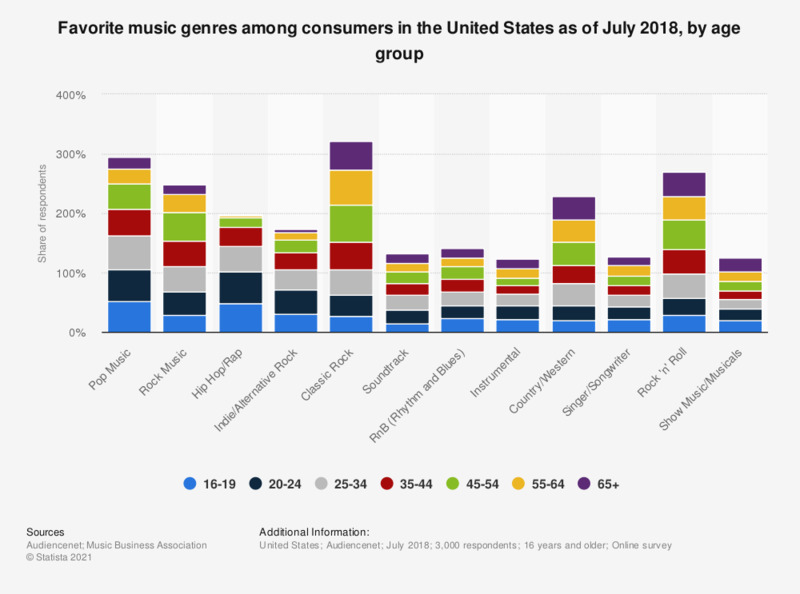 The statistic provides data on favorite music genres among consumers in the United States as of July 2018, sorted by age group. According to the source, 52 percent of respondents aged 16 to 19 years old stated that pop music was their favorite music genre, compared to 19 percent of respondents aged 65 or above. The genre is also widely popular among American teenagers, earning the second place and 15.3 percent of votes in a survey in August 2012. The first place and more than 18 percent of votes was awarded to pop music, rock scored 13.1 percent and landed in fourth place. Interestingly, Christian music made it to top five with nine percent of votes. The younger generation is also widely represented among country music performers with such prominent names as Taylor Swift (born in 1989), who was the highest paid musician in 2015, and Hunter Hayes (born in 1991). Country music is also able to attract crowds (and large sums of money) to live performances. Luke Bryan’s tour was the most successful tour in North America in 2016 based on ticket sales as almost 1.43 million tickets were sold for his shows. Fellow country singer, Garth Brooks, came second on the list, selling 1.4 million tickets for his tour in North America in 2016. This question was phrased by the source as follows: "Which of the following types of music do you generally like?" If you could only listen to one genre of music for the rest of your life, what would it be?